Planting grass seed in April is not too different from planting at other times of the year. The best time to grow grass is in August to early September according to the University of Missouri. However, you can plant grass seed in the spring as long as you apply enough water to keep the soil moist. One hurdle you'll need to overcome with April planting is weed invasion. Weeds grow vigorously in spring and weed seeds that have laid dormant all winter also begin to germinate. Till the soil to a depth of 3 to 4 inches and remove debris and rocks. Break up clumps and rake smooth. Ensure the grade is at a slight angle away from the house to prevent water from puddling by the foundation and possibly leaking into the basement. Firm the soil by rolling with a water-filled lawn roller. Pour grass seed into a broadcast spreader. Set the spreading rate according to the directions on the bag. Push the broadcast spreader back and forth over your yard. Look to see how wide of an area your spreader spreads the seed. Gauge the distance between passes so that the seed overlaps just a few inches. This will ensure complete coverage. Rake the grass seed gently into the soil. You will still see some grass seeds lying on top of the soil. Cover the soil with a thin layer of straw to hold in moisture and keep seeds from washing away in any heavy April rain showers. You will need one bale for each 1,000 square feet. Water the grass seed frequently so the soil does not dry out. During a dry spring you may need to water lightly once or twice per day. Apply a broadleaf herbicide according to the manufacturer's directions to the grass after you have mowed it at least twice. This will kill an weeds that sprouted up along with your grass seed. To obtain an established lawn more quickly, consider laying sod or planting grass plugs. 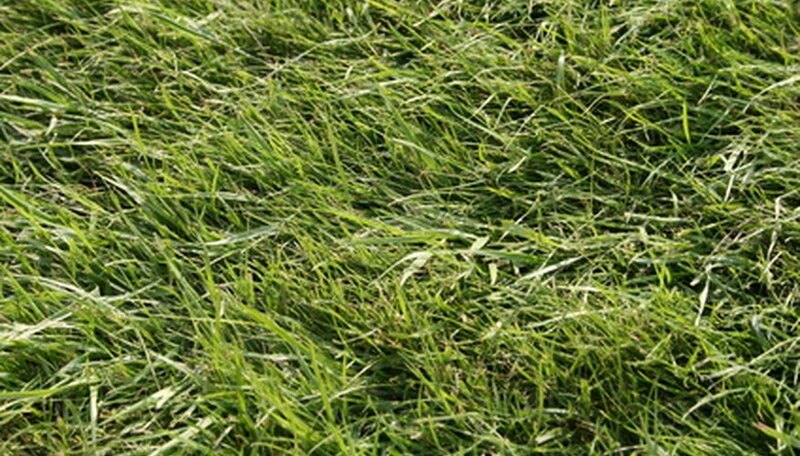 Avoid using broadleaf herbicide before you have mowed your lawn at least twice. Doing so could damage your young grass seedlings.